Eimear Noone’s Songs of Zelda album, A Link to the Celts, has recently reached its $30,000 kickstarter goal, and in only eight days, no less! There are still several days left until the kickstarter is closed, and you can still donate, so some sweet stretch goals have been announced. There are currently two goals listed, but more are said to be coming soon! Check out the goals after the jump! Prescriptions for Sleep Album Giveaway Winners! Gossip Stone (Album Giveaway! ): How Has Zelda Music Effected You? 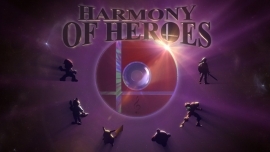 Just a few months ago, we featured the Smash Bros. tribute album entitled Harmony of Heroes, including 101 tracks and over seven hours of music. The team behind this project recently announced a brand new set of additional tracks, including several new Zelda songs. Harmony of Heroes takes fans from all over the world, arranging a variety of music genres from several Nintendo franchises. Hit the jump to take a look! Hylian Lemon, project leader of OverClocked Remix’s old Essence of Lime album, released a new remix album for Oracle of Seasons. As with Essence of Lime, the Lime of the Season album has several musicians gathered together to give fans new versions of music from an often under-appreciated game. Check out the trailer after the jump!